Is conventional wisdom the way things will really play out? The United States medicinal marijuana market, a $16.7B industry in 2016 is estimated to reach ~$50B by 2026. How it will get there is another question entirely. Conventional wisdom is that the entire industry will consolidate once Federal prohibition ends. But is this wisdom accurate, and how should different actors perform between now and then? A very complicated and complex scenario. Recently a group of Wall Street financiers, pharmaceutical executives, and large growers, met and challenged us to “rationalize the landscape”. While each group has an individual interest, no one has looked at the complex interactions of all the other actors that will ultimately affect their survival or profitability. This goes far beyond Big Data science and large computer predictive algorithms, as these solutions become challenged when unrelated complexities are involved. One example: Given completely non-conforming State by State regulations, what happens within each State when the Federal Prohibition ends? Have the States boxed themselves in such that their fears and protectionism rule out flexibility to nimbly adapt to the post prohibition landscape? What happens if Federal Prohibition lingers but lobbying groups advocate their own legislative interests one State at a time? States could replace one band-aid regulation with another as outside forces create chaos through unanticipated consequences. Why us? At Dialectic, we work on extremely complex problems such as counter-insurgencies, disease proliferation, and warfare, as examples. Our clients, range from the Department of Defense to the Fortune 50. 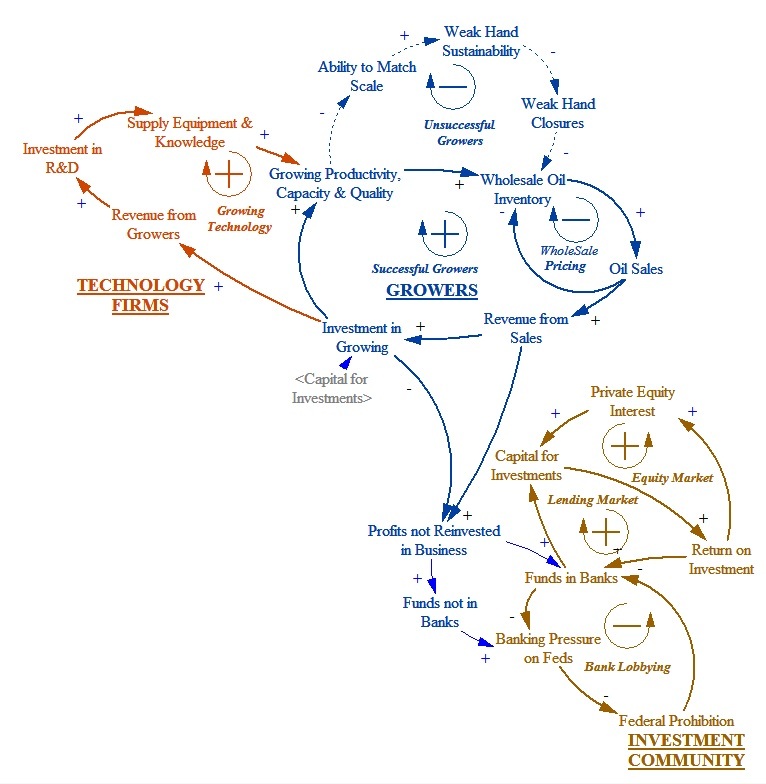 We build sophisticated system relation maps (using the science of System Dynamic), to identify the drivers, interactions, and relationships between different market segments. The map, while pretty to look at, cannot be absorbed all at once. We built each entity in the system painstakingly one at a time through consensus of the participants so that the logical relationships made sense. 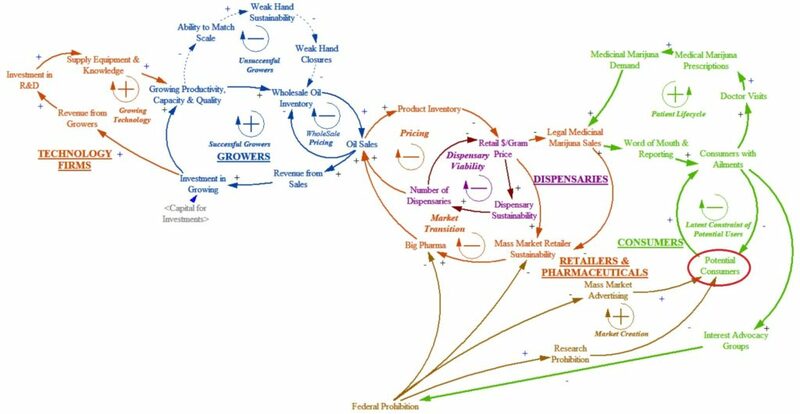 For example, the Wholesale Pricing loop for cannabis oils at the right isn’t rocket science. When inventory increases, sales rise – both from availability and falling prices. As sales occur, inventory drops, and prices increase. 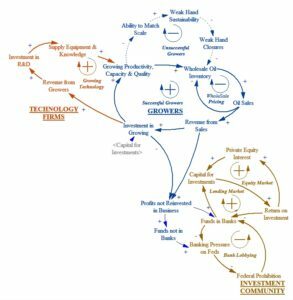 These system links create a simple feedback loop that seeks to balance inventory and oil sales. Simple on its own, but what happens when States go recreational, but have restricted growing to certain medicinal parties that are unable to satisfy recreational demand? Throw in CBD vs THC oils and it gets interesting. The larger map is made from equally simple links, but it is the interaction of all the links and loops simultaneously that, from years of practice, help an expert interpret how a system will behave under various simulated scenarios. What is the conventional wisdom? 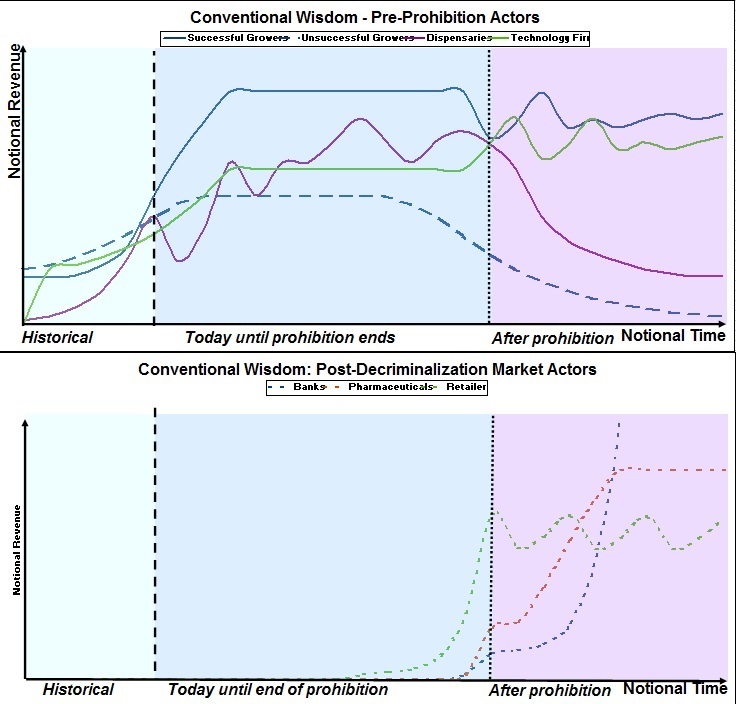 Is the common wisdom that the market faces consolidation post- prohibition accurate or not? This can be answered by focusing first on the center of the diagram. The team depicted notionally what would happen to the net revenue of key actors over time – those in the market now and those entering only after prohibition ends, and there are profound implications. We have charted out below how the entrance of the “big boys” will affect everyone. The logic of the model, simulating just those loops above, projects that as larger players enter, the tenuous ones are flushed out. Dispensaries decline as market share moves to big chain retailers, supplied by pharmaceutical companies buying from large growers. The conventional wisdom at first appears sound even though it leaves questions such as how will generics fare? Conventional wisdom might be wrong. But that’s only a few loops of the model. We quickly identified a “switch” in the Latent Constraint of Potential Users loop below. Let’s consider only medicinal marijuana patients. 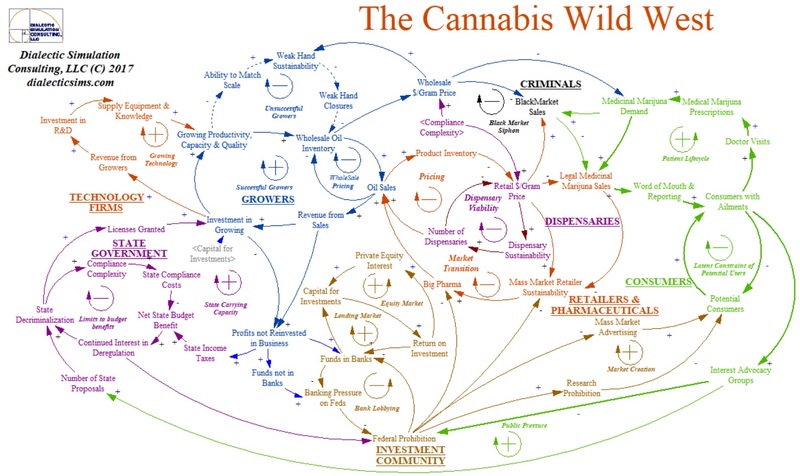 Currently, these medicinal consumer loops are driving the high growth in the market. More consumers with ailments lead to more doctor visits, more prescriptions, more sales, more word of mouth, all resulting in more consumers with ailments becoming aware of the products. However, this virtuous feedback is controlled by the “switch”, circled in green. This is the finite potential number of consumers in the country who may yet try a medicinal product, but haven’t become consumers yet. Alcohol has been legal since prohibition and yet only 56% of the population are regular drinkers so it is reasonable to assume that not everyone in the US will become a marijuana user. Every potential consumer converted into an active consumer, means that the remaining untapped potential consumers decline. We’ve already observed one scenario when States go recreational and restrict growing to certain medicinal parties they risk being unable to satisfy demand. But what about the opposite dynamic? …when States go recreational and restrict growing to certain medicinal parties they risk being unable to satisfy demand. Conventional thinking does not account tipping point thresholds. What happens if the supply of patients reached a tipping point where capacity begins to rapidly outpace demand rather than the other way around? The effects of this switch ripples back through the feedback loops creating systemic crashes to other unsuspecting and ill-prepared actors along the way. It is entirely possible that this theoretical potential of customers will be reached before prohibition ends. Instead of a consolidation wave to big actors after prohibition, the crash may happen earlier and be market-wide. This could help some actors survive in a better position than without the crash as shown below. Our model predicts that should this occur large operators will be less eager to enter a market that isn’t doing well. But combined with the other loops, this simple assumption creates the unanticipated situation where an earlier crash, for lack of new customers, forestalls the inflow of large operators, even after prohibition ends, thus preserving market share for the smaller operators. This isn’t unheard of. In both the dotcom bust of 2001 and the railroad crash of the 1870’s rapid over production of capacity got ahead of market demand. The resulting pause by major companies to re-engage created opportunity for second-generations startups like Google and Facebook to seize valuable market positions. Wealth creation may offset the fact that there will be big losers in the first generation of actors. How does inability to access financial services affect market dynamics? Will State licensing account for carrying capacity needed to supply consumers? When should investors enter the market, and where? What policies inadvertently aid black markets even as legalization proceeds? How will Canadian and European finances and operations affect the US? Each of these involves looking at a different combination of loops on the map and how they might interact. This leads to a blue-print map and building a full computer-based simulation. An expert can only simulate a few loops at a time, but a computer can handle dozens of interacting loops. 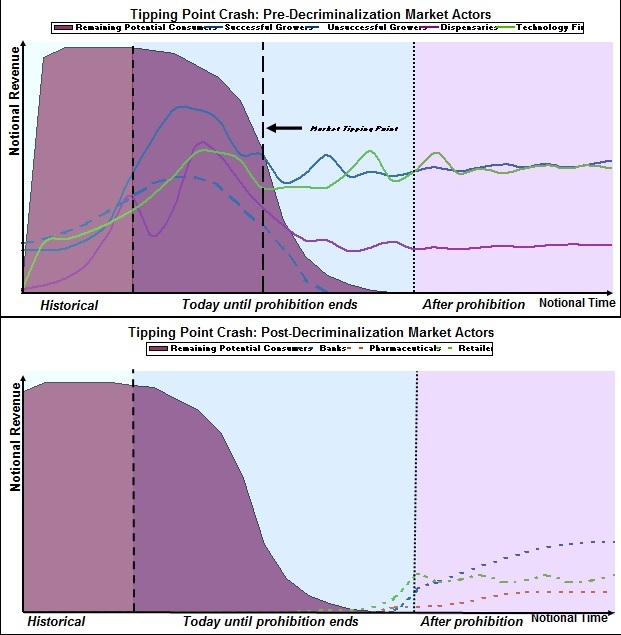 Computer simulations can also run thousands of iterations to identify leverage points, black-swan events, or to test strategies. For the risk averse, exercises like this are paramount. In conclusion, each actor must look deeply at the implications of everyone else, as a minor hiccup by another unrelated actor could prove lucrative or disastrous. A Wild West indeed!